Turns out that this is a double image of Saturn, taken way back in 1983 by the Infrared Astronomical Satellite (IRAS). Saturn was then at RA 13h45m18.2s, DEC -08d13m07s. It’s a false-colour image (i.e. not red at all), being taken at 100 microns, in the infrared region of the spectrum. But with enough spin, apparently it can be made to sound scary. In the final version of the infrared sky survey, this artefact was blacked out, since it doesn’t reflect any actual stellar infrared sources (just a planet that moves around). Of course, that removal got the conspiracy-theory nutters going. It has long been known that hydrogen forms a metallic solid at moderate to low temperatures and extremely high pressures. Last year, Ranga Dias and Isaac F. Silvera at Harvard University were the first to actually produce this metal, using the enormous pressure of 495 gigapascals (see their paper). At higher temperatures, hydrogen forms a metallic liquid, and this is believed to exist at the heart of Jupiter and Saturn. This liquid has yet to be observed. This wonderful mosaic image of Saturn (click for more details and larger image) is derived from 141 wide-angle images taken by the hard-working Cassini spacecraft. The image covers a region about 651,591 km (404,880 mi) across. As in this previously released image, Earth is clearly visible. The lakes of Saturn’s moon Titan (seen in a synthetic-aperture radar montage above) are most likely composed of methane and ethane: two natural gases which boil at a chilly −161.5 °C and −89 °C respectively. Compared to that, Australian winter weather is warm! 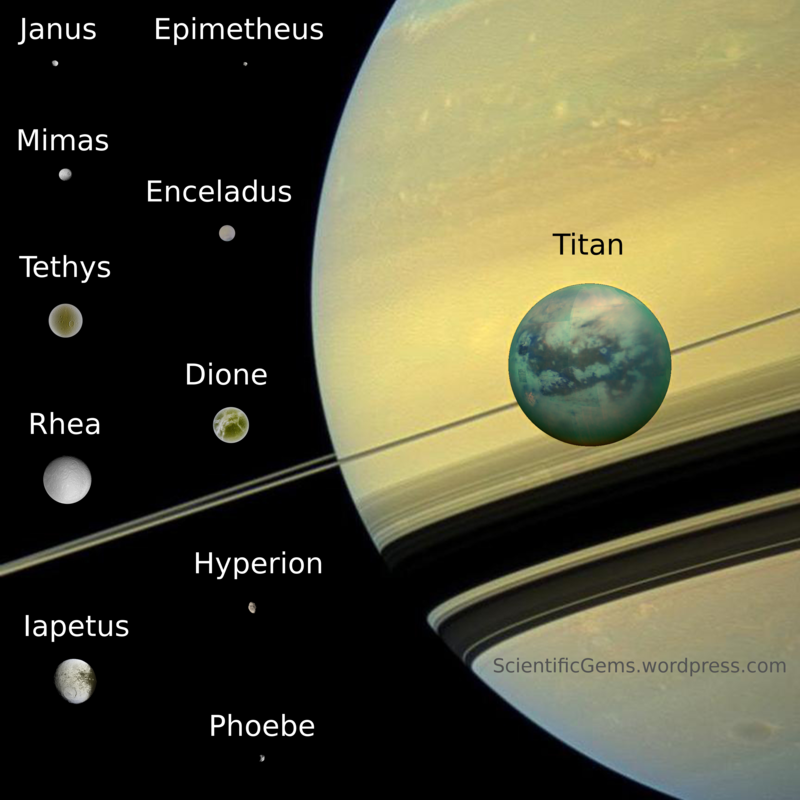 Unlike the mountains of Titan, the lakes are named after lakes on Earth, while the larger maria are named after sea-monsters like the Punga and the Kraken. In reality, there are no sirens on these seas. Well, probably not.